Santa Barbara cottage near Summerland beach. 2 bedrm/2bath retreat located on 1+acres near beach and Montecito. This remodeled beautiful cottage is perfect for an artist, writer, or a couple that wants privacy and a magical setting. It has a large stone patio with a dining area and an outdoor fireplace with a comfortable seating area overlooking the oak forest and mountains. The hiking trails are very close, as are several beaches. The living room has a daybed that looks out to the garden with its many nooks to relax. The kitchen is new with marble counters and a Wolf Range. There are large glass sliding doors leading onto the patio.. Each bedroom has its own bathroom. It has a large Smart tv. and laundry room. The cottage is very comfortable with lots of natural light from the 4 skylights and many windows. There is air-conditioning. The property is fenced and very private. Over 10 years ago I was looking for a property that had a large garden and a private setting where I could paint and write and still be close to hiking trails and the beach and yet close to Santa Barbara downtown. When I saw this place I knew that it was perfect for me. I now am ready to share it with new guests and friends. I love nature and here I am surrounded by nature.Hawks, owls and many other birds live in the oaks. There is always wildlife nearby and because it is more rural and not so lit up at night, the stars are unbelievably bright. What is so unique about the location of the property is its easy access to the beach, mountains, Montecito, Carpinteria, and downtown Santa Barbara, and yet it is just outside of the city noise and activity. located on over an acre with oak forest and creek. Beautiful maples, wisteria, roses and olive trees. 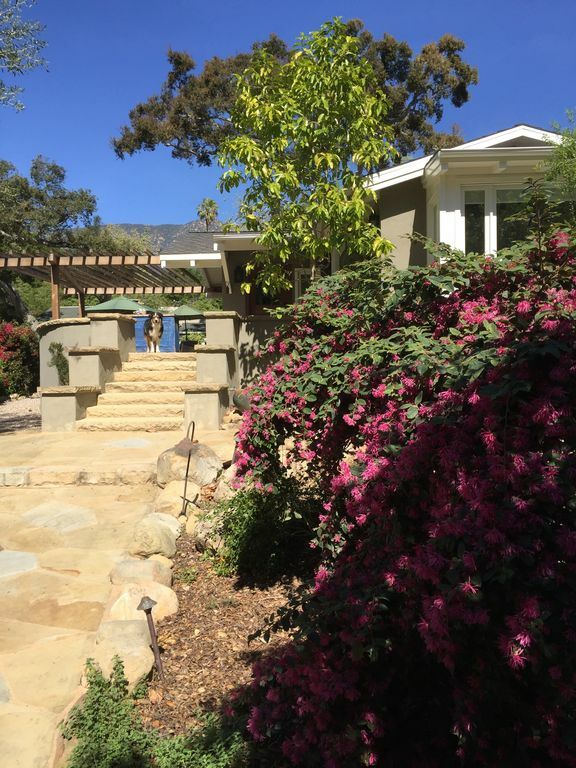 The property is located between the mountains of Santa Barbara and the ocean not more than a 5 minute drive to hike on the many trails or to go to the beach for a walk or swim. It is close to Summerland which has several antique stores and restaurants. It is also an 8 minute drive to the upper or lower village of Montecito. In the other direction lies Carpinteria, a small town with a wonderful beach and several more restaurants and bars and shops.